Inside the walls of the Dead Letters Depot, letter detectives work to solve mysteries. They study missing zip codes, illegible handwriting, rain-smudged ink, lost address labels, torn packages, forgotten street names—all the many twists of fate behind missed birthdays, broken hearts, unheard confessions, pointless accusations, unpaid bills, unanswered prayers. Their mission is to unite lost mail with its intended recipients. But when letters arrive addressed simply to “My Great Love,” longtime letter detective William Woolf faces his greatest mystery to date. Written by a woman to the soulmate she hasn’t met yet, the missives capture William’s heart in ways he didn’t know possible. Soon, he finds himself torn between the realities of his own marriage and his world of letters, and his quest to follow the clues becomes a life-changing journey of love, hope, and courage. 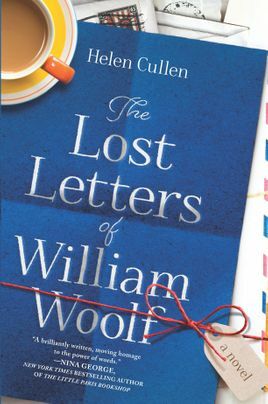 From Irish author Helen Cullen, The Lost Letters of William Woolf is an enchanting novel about the resilience of the human heart and the complex ideas we hold about love—and a passionate ode to the art of letter writing.